When a cute new company, based on comfort food and a Friday tradition, reached out to see about sending us some of their tees, I jumped at the chance for 2 reasons, 1.) because I loved their designs and knew my kids would too and B.) 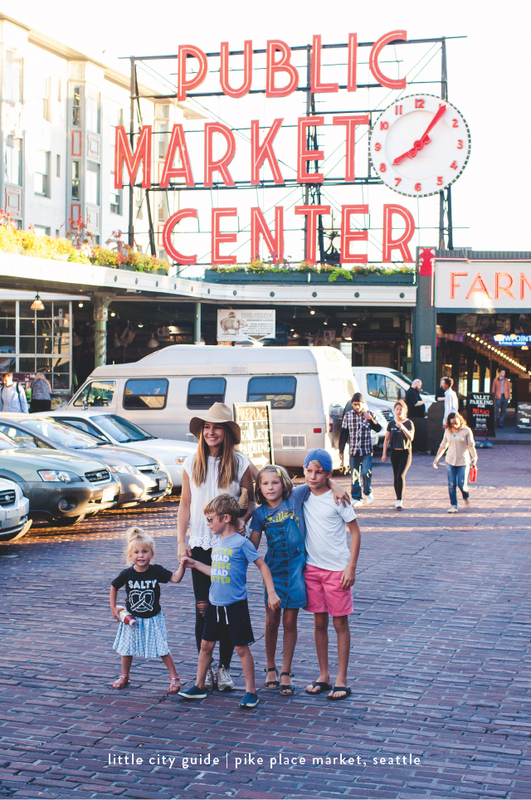 because the name of the company alone gave us the perfect excuse to plan a trip to Pike Place Market for our favorite Beecher’s grilled cheese. Our outing didn’t quite go as planned, but we had more than enough fun to make up for it, lots of cute pics to remind us of our day and are currently working on a very yummy plan “B”. Now for a ridiculous amount of pics because I love Seattle so much in the summer! Instead of fighting traffic to get to the middle of Seattle and try to find reasonably priced parking, we headed to West Seattle, parked on the street and took the 6:15 water taxi from Alki Beach to Pike Place. A quick 15 minute ride that was both low stress and a lot of fun! The jaunt from the pier to the market was a good 20 minutes (with kids anyway) and full of good people watching (did you spot captain america!?) and pretty sight seeing if you count the Great Wheel, water front, and these stairs decorated with lights and flowers along the way. … but it was closed. Noooooooo! Starving, annoyed and a little whiny (and not just the kids) we crossed the street and grabbed our go to bistro boxes and juices from Starbucks. While we snacked, the kids shared their highs and lows from the day… their low being the obvious lack of grilled cheese… and decided we’d make up for it by trying some new grilled cheese recipes at home. Hoping to have something share-worthy for you guys next week! Now with full bellies we attempted to take more Pike Place pics before heading back to the water taxi. Johan and I kept chatting about how comfortable Griffin looked as he walked around the city. A far cry from his anxious and OCD 4 year old self. A stage that he spent the last year growing out of. I’ll take Griffin anyway we can get him, but love seeing him so confident! We also couldn’t help but notice how much fun Tilly was having taking pictures with my old iPhone. I guess the apple doesn’t fall far from the tree! All that chatting and noticing had us loosing track of time tho, an easy thing to do on summer nights regardless, and we ended up having a home alone moment as we raced to catch the water taxi. By this time the kids were getting cold, Poppy was getting tired and we would have had to wait another hour for the next taxi, so running seemed like the only reasonable thing to do and it paid off! A tired and very salty Poppy by the time we made it off the boat, but even with the grilled cheese set back and missing Ozzie who had baseball, a perfect summer night. I’m still very much in the “summer forever” mindset, but if there is anything that can get me excited for fall it’s comfort food and more specifically grilled cheese sandwiches! And if you’re feeling inspired by Poppy’s pretzel tee, here’s our favorite recipe to make some at home! Happy (grilled cheese) Friday friends! What a fun outing! Sorry, Beecher’s was closed. Where did you find Tilly’s adorable denim overall dress? She looks so adorable. One of our favorite summer traditions is driving to Bremerton and taking the ferry into Seattle just as the sun is setting but we might have to shake it up this year with the water taxi. That looks fun! And the T’s are so cute! My girls need those- they’re always calling each other salty. oh my gosh, that’s so cute!!! ha! if you take the water taxi, leave time to grab tacos at mai kai. it’s pretty quick (order out/takeout or eat on the patio) and a few steps from where you catch the boat on alki,west seattle. so good! looking forward to the grilled cheese recipes!